New Delhi: Using a regular runway for flight operations requires skill and precision. Handling a plane – whether landing or taking off – on a taxi track runway only raises the stakes and the bar. Shattering the proverbial glass ceiling recently were two brave women pilots of the Indian Air Force who successfully undertook Parallel Taxi Track operations in their Dornier 228 aircraft. 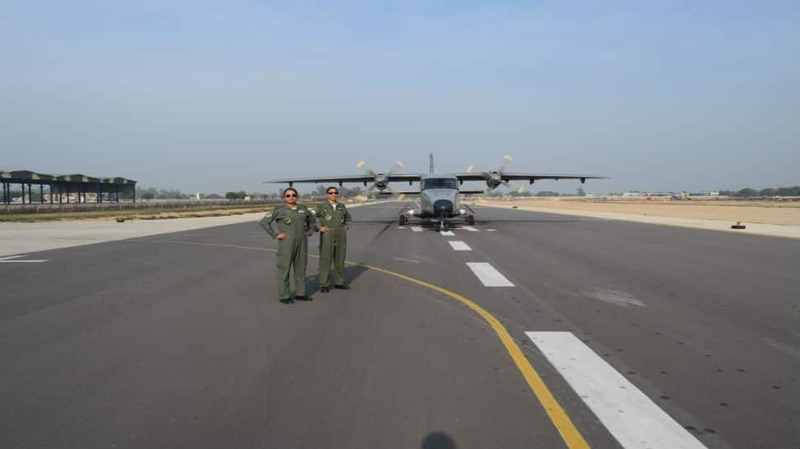 Sqn Ldr Kamaljeet Kaur and her co-pilot Sqn Ldr Rakhi Bhandari carried out successful parallel taxi track landing and take-off operations at Sirsa. Parallel Taxi Track operations are carried out to enable unhindered operations even when the runway is not available due to enemy action or any other reasons. PTT operations are a challenging task as the crew is required to land and take off from the taxi track, which is considerably smaller in width than the runway, with proximity to obstructions as compared to the main runway. There is no scope for any errors during the two most critical phases of flight – landing and take-off. The successful PTT operation undertaken only highlights the main theme of Aero India 2019 which begins from February 20 in Bengaluru. February 23 if marked as the day to highlight the achievements of women in the aviation sector.